Q: Any fond recollection of those games as a Student Coach? And I think in the ’95 season it would be Lawrence Phillips out there in Tempe just tearing it up on the field, having almost the game of his life. It was unbelievable just watching him, he had an impressive game as a running back, such a talented individual. Those couple plays kind of stood out to me, because I went to four Orange Bowls and one Fiesta Bowl in my five years there. It would have been nice to go to the Sugar and the Rose, like they have in the BCS now, but those were the ones we were hooked into. I’ve got 4 Orange Bowl rings and one Fiesta Bowl ring from my time there. Q: Any off-field stuff stand out? DS: I think the most memorable event (and you’ll likely hear this from a lot of players): We were at the Sheraton Bell Harbour -that’s where we stayed when we played Miami- and right before we left to get on the buses where they have the Miami-Dade Motorcade Police (when they take our three or four buses over to Joe Robbie Stadium or whatever you call it), but one of the audio-visual guys, they put together this video of the ’94 season: highlights of offensive plays and defensive hits throughout the whole season, and they put it to Phil Collins’ ‘In the Air Tonight’. (singing) “I can feel it coming in the air tonight…” That was like a five-minute video right before we left the hotel and got on the bus to leave for that game. That tape there? I don’t think any of the players will forget that, how motivating that was, and it fired up the players and coaches to get out there on the field and believe in ourselves to go and beat the Hurricanes. That was an awesome tape to music that they played to motivate us in closing the meeting up, before we got on the bus and went to the game. It kind of gives you chills, watching all the hits, and I think everybody walked out of there like they were on a different level, as a team. Q: So tell me, any recollections of the actual Florida game, which was your last game, right? DS: Yeah, Florida with Danny Wuerffel and Steve Spurrier, that was my last game. I think the preparation going into that game, Coach Osborne kept the players in very good shape. Everybody was running gassers and not slacking. I think after that Colorado game (we didn’t have a Big 8 Championship game), there were three or four weeks between that game and finals and all, but for those weeks we never let down on conditioning. It showed in that game, just hammering it to those guys in the third and fourth quarter, that we weren’t out of shape at all. I just remember looking over at the sideline at Steve Spurrier taking off his hat that he always wore and just, “What are we doing here?” I thought that was the best thing, him just shaking his head when we started scoring and scoring and scoring, and seeing the Florida fans start leaving Sun Devil Stadium. (laughs) They were like, “This is embarrassing.” (laughs) It was just like, not even a game. 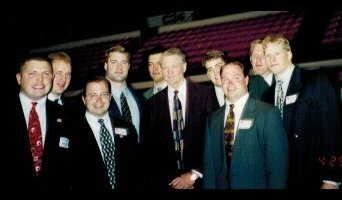 But I think that the Nebraska team -just like ’94- they believed in themselves and “if everybody does their job, don’t worry if we get down.” I think that’s one thing that Coach Osborne kept with his players: we never got into a panic situation. Whether we were down by seven or down by ten, “Let’s just focus on what we have to do and everybody do their job, and we’ll be all rright.” He talked in such a calm nature, and he would say that: “We need to get back to the basics and everybody execute the play and you do your job. Everybody do their job and we‘re gonna be fine.” And that’s how he was, very calm. And talking it through for people? Even if some people were frustrated because they missed a block or missed a run or dropped a ball -you know what I mean?- he would be very encouraging, “You’re going to get that next time,” and not be down on a player. He was going to point something out if something wasn’t done right -if you didn’t know the play or ran the wrong way- but I think it was his calm nature of talking with players that would not belittle you. He’d say, “Let’s work on this and you’ll do better next time,” and that’s the way you learn. Q: Do you recall any humorous moments with the coaches? DS: I know that the defensive line would always do some nasty, disgusting stuff for birthdays: the Girth. That was something where pretty much everybody would be off the field when that was going on. (laughs) It was something with the D-Line; they would do the nastiest stuff you’d ever want to know. (laughs) Birthdays or initiation, or somebody got a Blackshirt or a yellow shirt, or whatever, but they had some interesting stuff went on with that. Then you think of Coach Osborne and when he’d get mad. You knew he was really upset when he’d say ‘Dadgumit’, and that would be about as bad as it would get. DS: Yes, I believe that. That was pushing it for him. When he’d raise his voice and say dadgumit, you knew he meant business. (laughs) That’s as bad as somebody’s four letter words right and left, but he’d never do that. Other coaches would, but not him. DS: Yeah, and Coach Darlington could be, too. But I think Charlie keeping the defense in line? You kind of have to be pretty stern with people. Everybody knew he meant business and you need to get back to what you need to do. Q: So from the time you were a freshman to your last game there, can you recall a change in the mindset, the tenor, the atmosphere of Nebraska football? I know there were a lot of constants, but do any changes stick out to you? DS: I think when we came in in ’90 Nebraska had this stigma of “Coach Osborne could not win the big one.” We’d get in these big games in the Orange Bowl, but I think that as we worked each year and improved each year into that ’94 season, it had something to do with the morale of the coaching staff as well as the quarterbacks with Tommie Frazier and Brook Berringer and the confidence those two guys had. Just working with them and with the other players, they had a sense of control as to what was going on and what we were going to do. Remember those t-shirts we had made? Unfinished Business t-shirts? Just the ’94 and ’95 seasons, the way we approached each game, took one game at a time, didn’t look ahead to the next, everybody focused and executed to a level that other people couldn’t keep up with us. If you believe in yourself like that? That’s something that’s hard to explain to somebody. But when you get everybody believing that we’re going to win this game and we’re gonna do it, it would happen. It was interesting how that came through my last two years there, being a coach and being part of that team, as well, I think the self-confidence level we had at that time was something that a lot of other teams were never even close to having. Or they’d thought about it, but it wouldn’t all come together. Q: That self-confidence, would that be a result of ‘X’? And if so, what would that ‘X’ be? DS: I would just have to say that the coaches coming together… and everybody working toward one goal and doing their job and going to the highest possible level each time, every play, run that like it’s your last play of the game. DS: I don’t think that was preached. Coach Osborne could have said that, but everybody played at that high level, and when we’d go through practice on Tuesdays and Wednesdays it was full contact, full pads. We’d be hitting those people like it was game day. We wouldn’t take them to the ground, but having that aggression -especially the defense taking the hits during the week like that- you don’t lose that knack of hitting that you would if you weren’t doing that type of stuff. Q: Like the Callahan teams? They weren’t hitting during the week. DS: If you’re not doing that time after time and you have too much time in between? Maybe in the NFL you can get away with it, but I don’t think in college you can. That’s my two cents on that: you’ve gotta have the ‘hit’, because you can’t just run through it each time. If you try to do it on game day you’ll get clobbered. Q: It’s my thought that college kids easily to lose focus. What approach contributed to limiting mental letdowns? DS: I really think it had to do with the seniors on each team, and the captains who would get up and talk to the people and set the direction each week in the meetings. And we had the Unity Council, too, who would get up and say a few things. The upperclassmen were doing that, but the real thing would be the captains who would set the tone, and when those guys would say something it would be, “How high do you want me to jump?” The captains really dialed everybody in and broke it down by each game: what our goal was and what we wanted to get accomplished and how we were going to get there. And our goal was to get back to that national championship game every year -that was on the front of everybody’s mind each game- and I think the leadership we had really helped pull the guys together and keep everyone focused. Q: Any particular captain saying any particular thing to the team? Q: Was he actually voted dorm floor president one time? DS: Yeah, he was Harper Ten Floor President my freshman year. I was right next door to him with a freshman walk-on kicker from Wyoming. Q: It must not have been easy sharing a common wall with Christian? Q: How would you describe Christian in those days? DS: Christian, at that time: “never cross him.” And you were upfront and honest with him and did what he wanted to do, because come practice time he could put it to you. (laughs) He was a very strong guy and he did what he wanted to do. Q: Where do you think he got his motivation, not being a native Nebraskan? DS: I really don’t know. Christian was in a league of his own compared to Jason. Jason was a very talented player, too, but Christian had a side… when it was game-face time he had a game face. He was in a zone, that’s how he played. I think that’s what some of those defensive linemen have to do: put your mindset in a different zone. And he would do it. He was an animal. Q: What do you think set these teams apart from others of their day? DS: I think the walk-on program that Nebraska had, for sure. At that time, guys like myself and the Makovickas and the guys that come in and just worked their tails off to become a starter. I think it’s motivating in itself, because it’s going to drive and challenge those starters and the scholarship athletes, it’s going to push them to perform their best, too. When you have these guys fighting for their lives, living and dying and growing up Nebraska football fans, you’re going to have some talented players, and I think we had a lot of talented walk-ons who contributed to that team, gave their all to challenge the scholarship athletes. It made us a better team. DS: Seriously. And another thing, too, was switching the defense from the 5-2 that we did in the early ’90’s to the 4-3, when we got speed at the linebacker position. These guys were just blazing fast. That changed this team. Q: Your being a practice player and seeing it Tuesday, Wednesday and Thursday from your freshman to your third year, could you tell a difference as far as speed went? DS: Oh, yeah. When we got recruited in ’91 (and Darren and I were sprinters in high school), when they were recruiting us they said, “We’ve got to recruit speed at every position.“ And I remember back in the day when we were in high school and going to the games and seeing the linebackers, they were huge! They were 6’3” and 250 and they were huge, but they couldn’t run like the Ed Stewarts, the Doug Colmans, the Phil Ellis’s. Then you get into the defensive backs, the Toby Wrights. Some of those guys could just fly! Increasing the speed at these positions, I think, improved us as a team, and people were in shock because of how fast we were at each position in those years when we made that switch. Q: Darren, what would you say was your most valuable contribution? DS: I would say two things: the contribution of being on second team offense my first few years backing up the starters and supporting morale -which was a good thing- and the second part was running the scout teams for those ’94 and ’95 teams and helping Coach Solich, getting the team ready to play upcoming opponents on Saturday. It was a lot of time that went into it, but it was all worth it. Everybody was chipping in to do that, and you can’t do that with one or two individuals with the time and film breakdown. We wanted our defense -every play and every position that our guys would run?- it was our job to give them the best picture possible, to coordinate that 3rd and 4th string offense to do that. And they did. Q: Would there be any one person behind the scenes who never got their due? DS: That’s a hard one. I think it comes down to those film guys: Carpenter and Moose. The behind-the-scenes stuff they did? They don’t get the credit, the public wouldn’t know: filming our practices day in and day out, getting the tapes ready for coaches to review, exchanging tapes with the opposition. And sometimes, you know, we would have to sometimes go to opposing teams to get tapes, and not the team we were playing sometimes, too. I think it took a little creativity to get it from different teams. And I liked Bryan Carpenter a lot because he played there and sometimes he’d help us out with that position. But Bryan Carpenter and Brian ‘Moose’ Mohnsen did a lot of stuff and never did get much credit. A lot of people won’t realize how much work they put into that. If we didn’t have that we weren’t gonna be ready in preparing for the team. What they would do is break it down and slice and dice that tape. Q: Any memorable training room experiences? DS: I think the one that was interesting to me -I had a subluxed separation of my shoulder. I got tackled and kind of drilled into that hard turf before we got the better turf -and I had to do some really odd stretches with my shoulder on all these different moves with that rubberband-type device, that was a killer. And another thing was putting your ankle into that ice cold tub, where you could barely stand it and you were about to go crazy. (laughs) That was a nail-biter sometimes, dunking your ankle up to your calf in that ice cold metal… whatever they called that thing. Some guys would sit and submerse themselves in that. It was like a cattle tank. They’ve improved things dramatically since we’ve been there, but that was funny. Q: Anything you wish you would have done differently? DS: I wish I wouldn’t have gotten injured and played the whole five years like my brother did, but you have to play with the cards you’re dealt with. I was fortunate to be on the team and still coaching as a part of that team, because it would have driven me nuts to have gone to regular school and not been on the team. It would have driven me crazy. I wish that I would not have had the injury and continued to play that ’94 and ’95 season and do what I could. And seeing both sides of the ball? That -to me?- there’s not that many players/coaches can experience what I experienced, seeing both while I was there. Q: As a summation, what did you take away from that experience? DS: I just think that coming out of college and having Coach Osborne’s mentality of working hard every day and doing your job right, you’re going to be successful. That’s how I’ve carried on in my career, too. When I have a task: be very focused, get it done, exceed expectations, and strive for better the next day. The hard work ethic and the time we put in, being very structured and time-organized, it’s really ingrained in you how you should function as an adult. I had already figured they’d be in the mix somehow, but it’s now an absolute necessity that we hear from ‘Moose’ Mohnsen and/or ‘Carp’ Carpenter, the video guys. We’ve heard their names more than once, and as I go along I’m beginning to find points from earlier interviews validated and repeated, which is a nice thing to see. In a roundabout way I guess these many conversations are serving as default fact-checkers, ensuring that what was often previously out of reach of the average fan (or at the least, in the shadows) is now being exposed to light and expanded upon by repeat members. If one could pick another golden kernel of insight from Damon’s conversation it would be his remembrance of the midweek practices’ intensity: “We’d go through practice on Tuesdays and Wednesdays it was full contact, full pads. We’d be hitting those people like it was game day…” In other words, running like red heifers on Wednesdays didn’t translate well to blood-lusting Black Angus bulls on Saturdays. 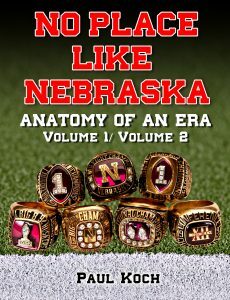 (We Husker fans saw what that type of philosophy can do for a unit even as revered as the Blackshirts in those Callahan/Cosgrove years) The coaches as a whole held no quarter when it came to physicality, no matter the day of the week. And were opposing staffs of the more skittish mindset, I can see how their players’ spirits could have been easily broken and bloodied come the typical third or fourth quarter of that 60 & 3 era’s Nebraska teams.